.......53 Buddhas and Me .................My Life Adventures.....: Bosco .... What the !!!!!!!! This is my son Shane's dog Bosco. He is a lovely dog - well he's still actually a pup at 11 months old and maybe I should add he is lovely most of the time. 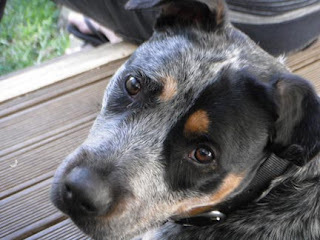 He is a very muscular solid dog for his age and is a mix of breeds but mostly a Blue Healer/Staffy cross. We are dog sitting him for Shane for the next four weeks, which is fine as he really is a nice people loving dog. 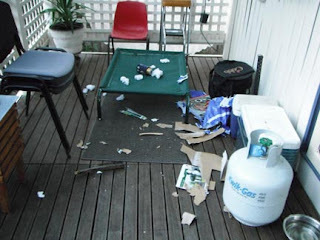 BUT - the first morning that Bosco arrived we awoke to a back porch that looked as though we had had a cyclone. Bosco had obviously gotten bored during the night and found everything that wasn't metal and chewed it to pieces. Luckily nothing that he demolished was of any value. All we could do was laugh - and get Shane to clean up his dogs mess. So every night since then we are going to bed prepared - there is nothing anywhere near him that he could possibly chew. Oh my goodness, I had to laugh! What a little brat but I'm sure that once he's used to you he'll calm down! Glad you could laugh! Pups are like little kids! Gotta love them even when they make messes! Bosco is a very cute albeit it slight high maintenance dog. I hope he gets used to being with you and settles down. Sending Happy New year greetings your way. I hope 2011 is a wonderful year for you. What an entertaining start to Bosco's visit, Davine!